I have this strange problem. When I play some game online I have every few minutes ~10s lag. As well as I am on skype. I cant understand even one word for ~10s. I dont know if problem is when browsing sites. Sometimes I can see longer loading of some site, but i dont know if is it related. I have few windows laptops here and they have no problem. 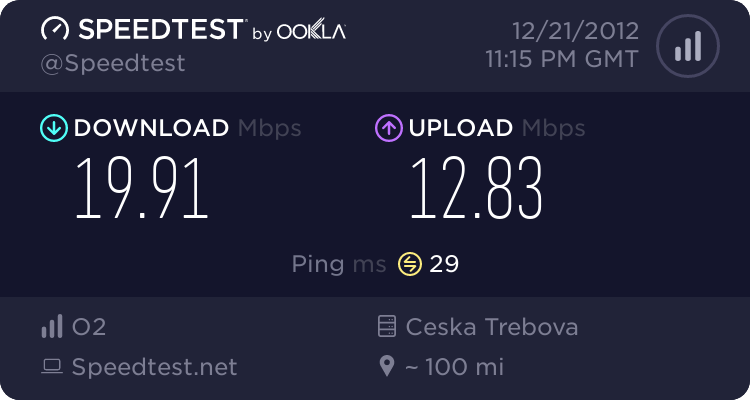 My internet connection is not so bad - http://www.speedtest.net/result/2387291327.png and all ports are opened. Where can be a problem please? Can you tell us more about your router and its relative position to the computer and your wireless signal strenght in % or dbm. Did the problem show after a kernel update? I would also check for kernel power management features that could affect the card. if you happen to have a livedvd laying around i would boot it up and see if the card has the same problems, if not ,check kernel version and drivers. At first I want say, thank you. I am glad you are interested about it. My router is old Edimax BR-6204Wg. On my hostel is some better router but I don't know name. I'll tell you when I will know it. Network is: few laptops on wifi --> router --> LAN cable going out of our apartment. In both cases I have 100% signal strenght - router is 2 meters from laptop at most (no wall or something between them). Maybe. I dont update periodically, but sometimes when I have time. So it should have to be longer time. Couple of months, maybe half year. I think it worked half year ago. to allocable memory for a new process and/or new file. flush the changes back to persistent file storage (like a hard drive). yet, just to hold down the backlog of "need to be written to disk"
do you have for this value? It's unlikely that a hard disk cache flush would cause network lag. it to 100 or 200. Its crazy but I think it helped. I looked into /proc/sys/vm/dirty_writeback_centisecs and there was 500. I set it to 100 and now I had lags but not that much. Instead of 10s I have 1-3s lags ... What else you think I should check or set? [EDIT] It was some good aura, cause today it was bad again. So probably /proc/sys/vm/dirty_writeback_centisecs didnt help. I have stopped cron and statusbars, looked into /var/log/messages and there is nothing (you can see it here http://pastebin.com/pemBnLkJ). [Edit] Using LAN cable instead of wifi - no lags at all. Are there any wireless options you can experiment with, especially e.g. disabling power-saving for the wireless card? From your description, the problem is clearly periodic. What else is periodic besides kernel buffer cache flushes? Three days I have been using wicd instead of networkmanager and I had no lags at all. No lags in games, no lags on skype, no lags in web browser. Cause I used networkmanager only by habbit and now wicd suits me better, I'll stay with it.